Master characters on the go! 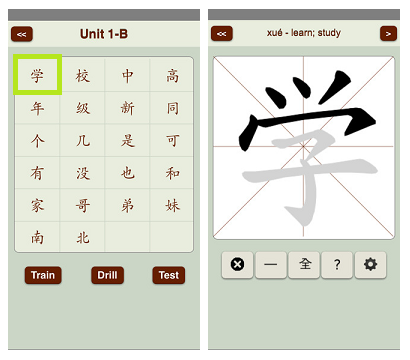 The Chinese Character Trainer mobile app is an excellent study companion for learners who are learning to write Chinese characters for the first time. It uses stroke-by-stroke animations to show how each character is formed. It then invites you to practice writing the character yourself on the touchscreen, and gives you immediate feedback on every stroke you draw. 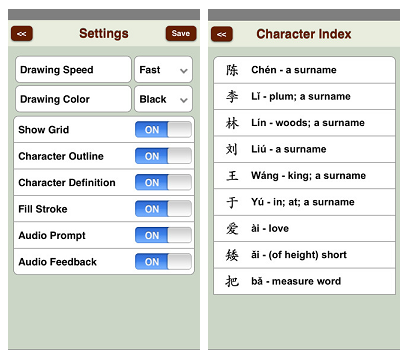 Besides learning to write the characters in the correct stroke order, the app also provides audio prompt, Pinyin romanizations and English definition for each character to help you recognize, read, and remember the Chinese characters introduced in the Ni Wo Ta program. The Lesson Menu Screen appears as soon as the app has finished loading. The scrollable menu lists the character sets in each lesson of the Ni Wo Ta textbook. Simply touch the name of any character set to open it. Once you’ve selected a character set from the Lesson Menu Screen, you’ll be shown a list of all the characters in that set arranged in a scrollable grid (Character Grid Screen). You can touch any character to begin learning how to write that character in the Train Mode Screen. Or you can use one of the three buttons at the bottom of the screen to begin a guided study session. Touching the Train button begins a Train Mode session with the first character in the selected set. Train mode is designed to help you learn unfamiliar characters from scratch by showing you how to write them, one stroke at a time, and then encouraging you to practice writing them yourself as many times as you need to in order to commit them fully to memory. If you think you know how the outlined character is drawn, you can try writing the strokes in the drawing window. If you write a stroke correctly, it will snap into position when you lift your finger. If you make a mistake, your stroke will be erased and you can try again. The full character will blink on the screen when you’ve completed it correctly. After a brief pause, it will then be erased so you can practice writing it again. In Drill Mode, you are prompted to draw each character in turn from memory. Drill Mode works like a randomized flashcards session, prompting you to write each character from memory based on the character definition and pronunciation, without the aid of an outline. If you make a mistake, you are shown the correct stroke order, and then you are prompted to try again until you can write the entire character correctly. Characters are removed from the flashcard deck when you write them correctly on the first attempt; otherwise they are put back into the deck for another try. When you’ve completed the entire set, you’ll be shown the results of your drill session and the percentage of characters, including repeats, drawn correctly. Test Mode works just like Drill Mode, except that you are given just one chance to write each character correctly. Your score is reported at the end of the test, so you an measure your progress over time. The Settings Menu allows you to control a number of things: the speed of the stroke animation, the color used for the drawing strokes, show/hide guide lines in the character writing box, show/hide character outlines in Train Mode, show/hide English definitions, control the display of user-drawn strokes (fill stroke) in Train Mode, turn audio prompt for each character on/off and turn audio feedback in response to the user's actions on/off. The Character Index is accessible from the Lesson Menu Screen (final item on the list). It displays all of the characters included in the app in alphabetical order by pinyin. Where to purchase the app? The apps works on smartphones, as well as tablet devices running Apple iOS 5.0+ or Android OS 4.1+. You may purchase and download the apps from the iTunes App Store or the Google Play store. Type in the search term "Ni Wo Ta". The Volume 1 app icons are as shown on the right. © 2015 Cengage Learning. All Rights Reserved.